Your source for custom, one-of-a-kind swords, knives, and athames since 1982. Omega Artworks can make you a beautiful, lasting, and unique artwork in steel or bronze. We specialize in custom athamés, swords and knives, but are ready to design any item to meet your desires. We do all work in our studio in St. Paul, Minnesota. 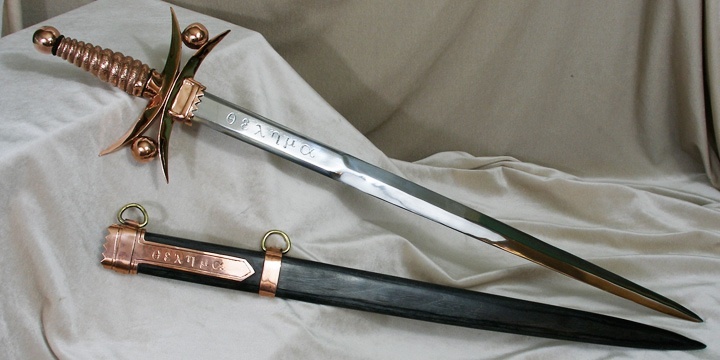 Since 1982 we have been designing unique and original swords, knives and sculpture. We offer a wide range of options for custom swords and knives, but also keep a stock of items available for purchase today! Our objective is to combine beauty with functionality to create a work of art. Whether a sword, athamé, or cane, our art is beautiful to the eye, thrilling to the hand and inspiring to the imagination. As you look through our website let your imagination go, then contact us and let us know what you are thinking. Get social with us! See our updates on items for sale and upcoming events.